House of Funk in Vienna? The "Funkhaus" in Vienna is not what it appears to be to the English native speaker - in German, "Funk" refers to radio signals in communication and media. 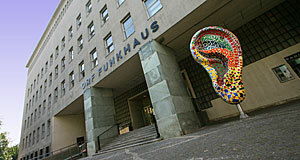 And the "Funkhaus" is the old headquarter of the National Austrian Broadcast, the ORF (my former employer). The Funkhaus can be found in the Argentiniastraße, and if you refer to this road, people often immediately associate it with the Funkhaus - which is sometimes also called "Radiokulturhaus". This is the official name, but less common in vernacular use. The Funkhaus is home to the more "sophisticated" radio channels of the ORF, such as FM4 (a partly English channel that plays a lot of independent music and targets a studenty-urban audience, but is unfortunately rather Viennese) and Ö1, the culture and education channel of the ORF. The main-stream channel Ö3 has been transferred to Heiligenstadt. The ORF′s local TV channels for Vienna are also produced here, whilst the nation-wide ones work from the ORF Zentrum in Hietzing (which is where I worked). The Funkhaus is an architectural gem in the 4th district. It was built between 1935 and 1939 and made use of a building that had preciously occupied the site. It is one of the few noteworthy late Art Deco buildings in Vienna; the architects in charge were Clemens Holzmeister and Hermann Aichinger. Back in the days, the ORF was still called RAVAG and I imagine it was a lot less corrupt than it is today. In 2007, I did my speaker′s training in the Funkhaus - it borders to the park of a very posh private school, the Theresianum, and the Austrian Diplomatic Academy. In January and February of 1945, the Funkhaus was severely damaged, but continued to be on air until the withdrawing SS blew up the last transmission station on Mount Bisamberg. Soon after the fighting ceased, the radio started to transmit again. The Funkhaus was in a part of Vienna that was administered (upon being plundered) by Soviet troops. The Soviets showed little interest in to use the equipment for their own means, but soon allowed to start a regular radio program. Much of the interiors of the Funkhaus survived the war and can still be seen. Between 1979 and 1983, the Funkhaus was extended according to plans by the star-architect Gustav Peichl (who also draws caricatures for the daily paper "Die Presse"). In 1999, the Funkhaus became a listed building, which finally reserved the place in Vienna′s architectural history that it deserves. The Funkhaus is also home to the Radiosymphonieorchester, a symphonic orchestra that the ORF owns and runs mostly for the sake of producing its own radio recordings and independent performances. The main theatre of the Funkhaus is still used for concerts and cultural events of all sorts and makes the Funhaus a cultural centre for the 4th district and beyond. If you want to visit the Funkhaus, there are several ways to do that. You could go to one of the concerts, shows or public readings that are organised there. Or you just stop by for a coffee at the Funhaus Café and have a look at the entrance area. Or you do a guided tour - which is the "in-depth" experience of the Funkhaus, but targets primarily an Austrian clientele - since they often associate the Funkhaus with all sorts of legendary broadcast programs. Attractions nearby include the Karlskirche and the attractions of the Karlsplatz, the Künstlerhaus and the Wiener Musikverein, the Technical University, the Palais Schwarzenberg and the Belvedere Palace and gardens. The neighbourhood of Wieden is good for a relaxed stroll, browsing small, independent shops or eating out.